A new time-reversible, multiple time step (MTS) method for full QM and hybrid QM/MM Born-Oppenheimer molecular dynamics simulations relies on a fully flexible combination of electronic structure methods, from density functional theory to wavefunction-based quantum chemistry methods, to evaluate the nuclear forces in the reference and in the correction steps. 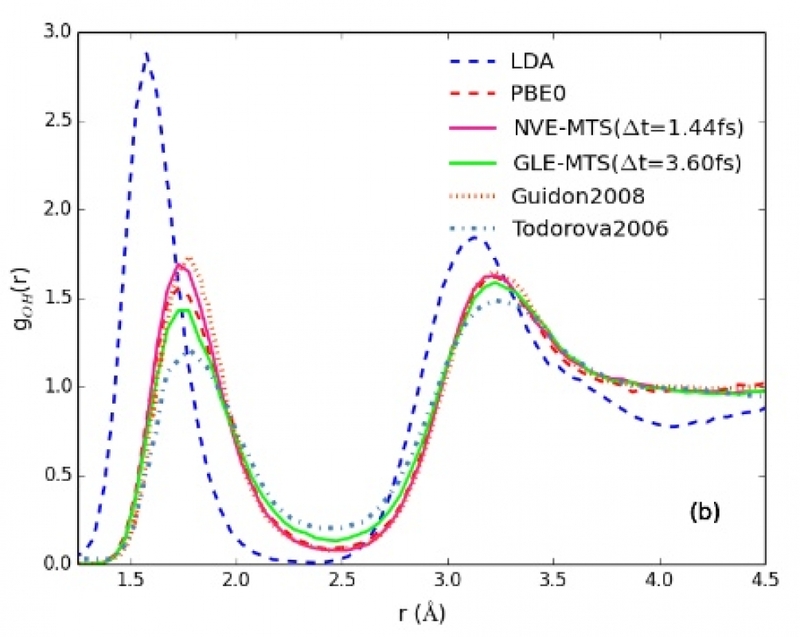 The possibility of combining different electronic structure methods is based on the observation that exchange and correlation terms only contribute to low frequency modes of nuclear forces. We show how a pair of low/high level electronic structure methods that individually would lead to very different system properties can be efficiently combined in the reference and correction steps of this MTS scheme. Fig. 4b. Intramolecular oxygen-hydrogen radial distribution functions obtained with LDA-VV MD (blue, dashed), PBE0-VV (red, dashed), LDA/PBE0NVT-MTS MD (magenta) and GLE-MTS (green). For comparison, the same quantities from Ref. 22 (orange, dotted) and Ref. 44 (light blue, dot-dashed) are shown.